Six Nations 2015: Should Wales make radical changes? "The manner in which Wales surrendered defeat in the face of a second-half onslaught was a cause for alarm." Before the 2003 World Cup, an experimental England side travelled to Cardiff to take on a full-strength Wales. They won 43-9, and Wales were left reeling. Their World Cup preparations were left in tatters. 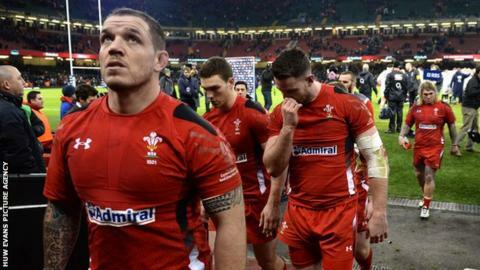 Friday's 21-16 defeat in Cardiff in the opening Six Nations game was not a Wales disaster on this scale. Far from it. But the manner in which Wales surrendered defeat in the face of a second-half onslaught was a cause for alarm. If a parallel can be drawn with 2003, it's this: Wales were at full strength with 11 Lions ready to roar in front of a rabid home crowd; England were a patched-up side missing 12 first-choice players. The theory pre-match was that Wales had everything to lose. When your undisputed first-choice XV fails to deliver, you have to hope it was just a bad day at the office, that the lethargy can be shaken off before the next battle lines are drawn. No nation is as prone to self-flagellation in the wake of defeat than Wales, and social media in the delicate, emotional hours afterwards was abuzz with forebodings of doom. At the other end of the scale, I encountered one conspiracy theory that Wales had "thrown the game", as part of a covert psychological campaign to falsely bolster English confidence ahead of the World Cup. Utter nonsense, of course, but a reminder of the curious path fans can travel to seek solace in the bitter aftermath of defeat. The events of Friday night filled Wales with doubt, and England with conviction. England coach Stuart Lancaster now knows he has a back-up XV that can batter its way to victory in the most hostile of surroundings. Not a bad insurance policy ahead of the World Cup later this year. But doubt does not necessarily translate to despair. We only have to go back to last season to remind ourselves of Wales' powers of renewal. After suffering a far more crushing defeat to Ireland in round two than the one on Friday night, they rallied to beat France comfortably in round three. And a chastening opening-day defeat, also to Ireland, in 2013 was enough to galvanise Wales into a Championship-winning side. Wales are slow starters. It's a fact. They will hope their recovery begins in Murrayfield on Sunday against a Scotland side that, despite earning plaudits on the weekend, fell to their 14th opening-day defeat in 15 tournaments. After the game in Paris, former Scottish half-back partners, Andy Nicol and Gregor Townsend both scoffed at the suggestion Scotland would be favourites this weekend. Wales, they insisted, remain one of the big beasts and should not be dismissed after one lacklustre performance. France spent much of the first half at Stade de France playing with the sort of devilry that has been absent for much of head coach Phillipe Saint-Andre's reign. But they left that sense of verve and ambition in the changing rooms at half-time, reverting to a power game that ultimately squeezed the life out of the Scots. While the visitors showed an enormous amount of courage in defence, they were not able to get enough sustained possession and field position and, like Wales, failed to score a point in the second half. They will be desperate to right those wrongs in front of their home fans. The consensus seems to be that Wales will not panic, and will not make radical changes ahead of their trip north. But what if coach Warren Gatland and company were to do by choice what Lancaster did by necessity: pick in-form players from outside the established order. England's biggest problem areas were perceived to have been in the second row, and in the midfield. Yet those who were picked there excelled. Dave Atwood was at the heart of England's superior physical effort, and Jonathan Joseph was the man with the keys to unlock Wales' notoriously mean defence. Had he been available, it is likely that Brad Barritt would have been selected ahead of Jonathan Joseph. But for all Barritt's defensive solidity, I would wager he would not have been able to finish Joseph's try. The Bath man had the agility and the footwork to evade the onrushing defence, and pirouette over the line. It was a crucial moment in a one-score game. Wales have game-breakers who can produce similar moments of magic. Liam Williams is one such player. He has an innate rugby intelligence, an ability to look up, spot gaps and exploit them. Time and again this season, he has kept the Scarlets in games with his intuition, inventiveness and sheer audacity. Scarlets team-mate Scott Williams has a similar creative spark. And when Justin Tipuric and Sam Warburton were paired at six and seven for Wales against England two years ago, they ran riot. That was an injury-enforced selection, but it paid off handsomely, with Tipuric involved in both Alex Cuthbert tries. Wales have come to rely on their size and power to bully European teams into submission. And sometimes it does take a bludgeon to soften an opponent up, to expose their underbelly. But it's then you need the rapier, to apply the killer blow. Those players mentioned above all have those swashbuckling qualities required to do just that. Perhaps it is time they were given a chance to breathe some new life into this team, if only to persuade the management that there are alternatives. It is a lesson Lancaster has arguably learned by accident.